A lightning strike — and the powerful surges and fields it creates — can wreak havoc on sensitive electrical components if that equipment isn’t sufficiently protected. According to the best meteorological estimates, the surface of the earth is struck by lightning approximately 100 times each second, which averages out to about 8 million strikes per day. In addition, the Federal Aviation Administration reports that the average commercial aircraft gets hit by lightning on average about once for every 1,000 hours of flight it completes, which amounts to approximately once a year. With statistics like these, it’s obvious that providing adequate lightning protection to electrical components is crucial — whether that’s onboard an aircraft or as part of a ground-based facility. Fortunately, at NTS, we’ve been helping companies do just that for well over 50 years. Thanks to our lightning simulation and modeling services, companies are able to develop high-quality products that meet with their respective compliance regulations — from military and defense to Airbus and Boeing published standards. Why Do We Do Simulation and Modeling for Lightning Protection? Ultimately, we carry out lightning protection testing because of the catastrophic effects lightning can have on insufficiently protected systems. Whether it’s a direct hit or some indirect effect of this powerful release of energy, a mission-critical electrical system that’s part of an aircraft or ground-based facility needs ample protection from this potentially system-wide interference. Direct effects: The direct effects of lightning include both extreme heat — in the vicinity of 35,000 to 50,000 degrees Fahrenheit — and high electrical current — in excess of 200,000 amperes — which are generated in the lighting channel. At NTS, we employ Marx-type impulse generators capable of producing over 2 million volts to properly simulate the effects of a direct lightning strike. Indirect effects: With voltage rises and subsequent component damage possible even as far as a kilometer away from a direct strike, testing for the indirect effects of lightning involves specialized testing methods that our engineers are highly skilled in. We can apply a wide assortment of test methods, including pin injection, capacitive injection, transformer injection, ground-circuit injection and various techniques of field immersion. What Is Lightning Simulation Testing, and How Does Lightning Modeling Work? The team at NTS utilizes simulation testing to analyze lightning protection designs. By creating models, we are able to predict the risks and behaviors of lightning on your product earlier in the design process. These models will enable the evaluation of alternative designs and leverage similarities between designs. Lightning protection simulation and modeling provides a safer and more cost effective process to validate the design of your lightning protection. Most protection designs need to be implemented during the overall design phase of a project, before a physical test is possible. Under protecting something causes considerable cost and schedule delays and some designs simply cannot support “after the fact” protection designs. NTS uses Maxwell’s equations to predict the distributions of lightning current, calculate voltages, and ultimately quantify the risks for damage (arcing, sparking, etc.). 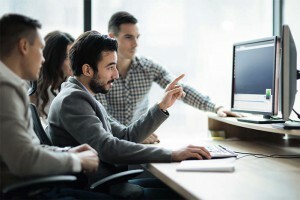 In many cases, simulation and modeling provides higher fidelity data than testing, due to the ability to fine tune materials parameters, and run dozens of permutations of design configurations over a short period of time. Lightning protection models are built from CAD-level data into COMSOL native shapes. We determine what is electromagnetically important and make clear, concise assumptions on what features should be included or not. The models simulate physics via Maxwell’s equations (the foundation for electromagnetism, optics, and electrical circuits) and replicate an actual test set up (e.g. return paths to the generator). Modeling comparisons are captured in a detailed validation report that serves as the “go or no go” portion of the projects. If the model shows sufficient agreement with the measured data, it can then be said that the model is an appropriate representation of the real test article. If the model does not show agreement, alternative modeling approaches can be taken, or the project can stop to reduce the program risk. A model is yet to be developed that does not agree well with the measured data. Once the model has been validated, it is returned to a general purpose setup. Boundary returns are used to remove any influence of any test setup specific artifacts that may have been included, physics and boundary conditions are not changed. The model can then be manipulated as desired without having to undergo further testing. Fully developed models allow for early lifecycle data, which reduces certification risk, verifies design methodologies for future (similar) aircraft designs, and can be used for similarity analysis on future designs to reduce testing, etc. Additionally, fully developed models allow for the examination of areas where test measurements could not be taken. To learn more about lightning protection and COMSOL analytical modeling at NTS, contact us today. 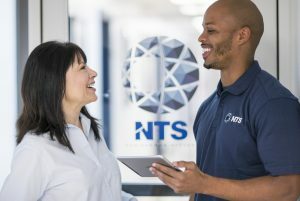 At NTS, our advanced facilities and considerable experience with lightning simulation make us a trusted testing partner for manufacturers and contractors of all types of mission-critical electronic components and systems. In addition, our engineers are always happy to help assess the requirements of your project — whether it needs to be in compliance with military, NASA or private industry standards. We’re standing by to provide insights, give advice and offer support for your next project. Feel free to request a quote or talk to an expert at your convenience. We look forward to hearing from you.